GP: The range of Ahmet Altan’s prose struck me from the start. At times it’s incredibly sensory, at others very matter-of-fact. Nevertheless, the narrator’s voice always maintains a base-level verve that pushes everything along. What about Altan’s Turkish was most difficult to render into English? BF/YT: What was most difficult to render into English were the long, complex sentences. These sentences have a distinct rhythm of their own. They are also, as you say, often quite sensory, and flow with a current that forms an essential part of the narrative, which indeed drives the narrative. Differences in the grammatical structures of Turkish and English make it impossible to reproduce this rhythm precisely. It was often necessary to change the order of words and clauses in order to reflect this rhythm and the visual, auditory and tactile elements in a fluid manner. GP: Did Ahmet Altan’s recent life-imprisonment, and the worldwide appeals for his immediate release, affect the translation process itself? Did you feel more urgency than usual to accurately communicate a writer’s vision? BF/YT: We began translating Like a Sword Wound ten years ago, so no, the life sentence did not affect the translation process or cause us to feel more urgency. What we felt was, simply, the joy of translating literature. However, as we translate the second volume of the “Ottoman Quartet”, Love in the Days of Rebellion, we are very aware of Ahmet Altan’s plight. Health problems delayed our completion of the translation, and as we know how important the publication schedule is to him, this did give us a sense of urgency. In practical terms, communication with the author is difficult: we can only communicate through his lawyers, who can only see him once a week. They are not allowed to give him any written materials or take any written materials out of the prison. GP: Could you say a little about how you both ended up translating Like a Sword Wound? Also, when can English-language readers expect the other volumes of the “Ottoman Quartet”? BF/YT: We are freelance translators—we have been working together for fifteen years and have translated over twenty books. Apart from literature, we have also translated popular novels, business books and biographies, screenplays, and teleplays, as well as catalogue texts for museums and galleries about contemporary Turkish art. Translation is our only source of income, and we take a mercenary approach. We don’t seek out books we want to translate. We have a reputation, people come to us, and we are willing to work with anyone who comes to us with a serious proposal. So, to answer your question, Ahmet Altan approached us, we met, and we reached an agreement. The second volume of the “Ottoman Quartet”, the translation of which is nearing completion, is scheduled to be released in October 2019. The publication of the third volume has not yet been scheduled and Ahmet Altan is still working on the fourth volume, which has not yet been published in Turkish. GP: What is the current status of Turkish literature in translation, in English or otherwise? What writers do those of us without any knowledge of Turkish need to look out for? BF/YT: Few Turkish writers have been published in English translation. Those who have been translated constitute a diverse group, and judgment of their work is a matter of personal taste and preference. However, we can suggest that anyone interested in exploring Turkish literature might begin with Yaşar Kemal, if for no other reason than that he was the first modern Turkish novelist to be widely read in English translation and can be said to have paved the way for those who followed. Yelda Türedi was born in Mersin, Turkey, in 1970 and studied chemical engineering at Boğaziçi University. Brendan Freely was born in Princeton, NJ in 1959 and studied psychology at Yale University. They have been working as freelance literary translators since 2004. Among the books they have translated are Two Girls by Perihan Mağden and The Gaze by Elif Şafak. 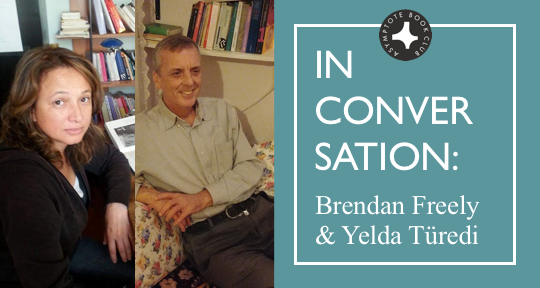 Brendan Freely is also co-author, with John Freely, of Galata, Pera, Beyoğlu: A Biography, about the social history, architecture, and topography of the Beyoğlu district of Istanbul. Garrett Phelps is an Assistant Editor at Asymptote. He graduated from St. John’s College in Annapolis, Maryland, with a degree in Philosophy and Literature. He is currently based in London.